A wide array of equipment and processes are involved in producing primary steel products after the melting, refining, casting, solidification, reheating and forming steps are completed. Strip, skelp (flat steel product that's welded into tubing), plate, bar, rod, seamless tube, structural shapes and rail products are (depending on the exact product and end-use) cleaned, heated, coated or plated, annealed, or otherwise processed. Gas-fired equipment utilized to complete these processes fall into two main categories (direct-fired and indirect heated equipment). Electric systems use elements directly exposed to the process or can be sheathed into protective tubes. Induction systems are also utilized. Also, combined induction and gas-fired systems are being considered. Direct gas-fired systems are usually designed so that the flame does not impinge on the work being processed and the products of combustion (through convection, either by the products themselves moving from the burner to the exhaust flue, or aided by a fan), circulate around the processed products (aiding heat transfer and allowing tight temperature uniformity specifications to be met. 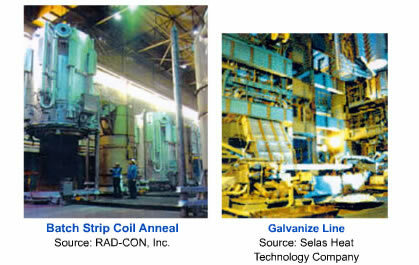 Indirect gas-fired processes utilize radiant tubes, or muffles and/or retorts, to separate the combustion products form the surface of the solidified products being processed. 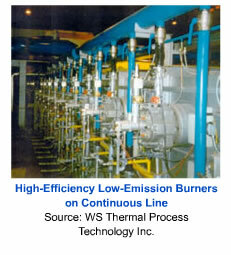 Generated or prepared atmospheres are commonly utilized. 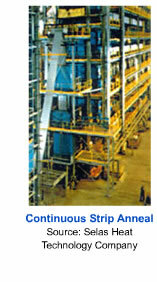 Protective atmosphere furnaces and tank heating systems are two examples of typical indirect heating applications.